You have to take the measurement scale into account, but some of the (over 200!) images made were absolutely shocking. There are some major air leaks in and around the house! As final test, smoke was used: you turn the blowers around to create a slight over-pressure, turn on a big smoke generator (of the kind used in shows on-stage), get out of the house, and watch the smoke appear – it was literally everywhere, even in the neighbour’s houses! So in ideal conditions what color should predominantly be in the outside pictures, blueish? For instance, in the first picture, the front door is pretty orange — does that mean that the door is a trouble spot and a door that radiates less heat to the outside would be more desirable? Yes, temperature flows most from hottest to cold. The hotter the spot is in winter, the more it means it’s “feeding” heat into the outside air which is cooing that same spot all the time. So the color really indicates where heat is being sucked out of the house. The door is the one single-glazing left in the house – and will definitely be replaced before next winter. The color is entirely relative, so no matter what, some area is going to be white. I’m betting the door is warm because it was replaced for the blower, and it just doesn’t insulate as well as a tall door. I didn’t turn on more radiators, but I did heat things up a bit more than normal. The upper floor consists of closed rooms, whereas the bottom two (above the garage) are in open connection. I’m also very surprised by the heat crossing over to the next house, in particular because there are two inner walls (“ankerloze spouw”). Nice images, wondering if you can tell us which camera was used? Sorry, I don’t know what brand. A few years old, running Windows CE (he had to reboot a few times, cursing), and in the €10K price range – that’s all I know. 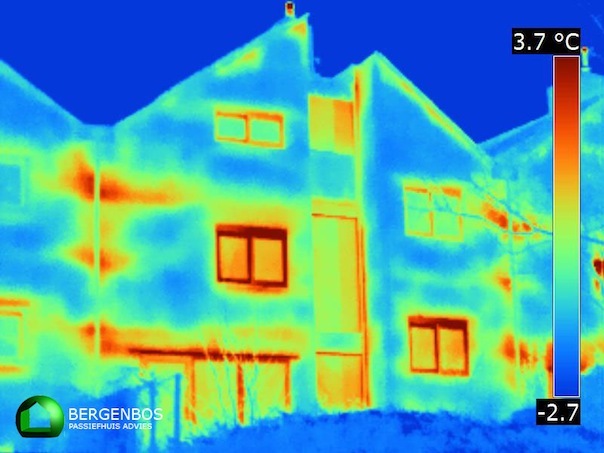 Would you mind giving (an idea about) the cost of doing such a thermal imaging operation (but not the blower door test)? This particular test was done as a personal favour with a special price, but basic test is in the €500 .. €1000 range. Quite a bit of money, but as it’s going to help me save on the isolation measures by focusing on what’s most important, I think it’ll easily pay for itself. That’s nice, but I live in a house built in 1927, which is big, and leaky/drafty all over the place. Because it is considered a monument, I’m not allowed to stick solar panels on the roof. JCW can get his electricity consumption down to 0W, in our household I’m very pleased if it drops below 800W in the middle of the night. So yes, I make small improvements (LED lights outside), but we have a freezer, two fridges, two separate heating systems, a server running all the time, a large NAS, 4 people with mobile phones, iPad’s, laptops etc. I could get thermal images, but they’d just tell me what I can feel already… and there’s not much, building wise, I can do about it. We’ve got double glazing on most windows already. Part of the insight I got from these people, is that it’s not just about thermal conductivity, but also about taking measures against leakage. That can be addressed in any house. Any wind (i.e. pressure differential) will cause these air currents, and our house was so leaky that they had trouble building up their standard pressure differential. When smoke was added in the basement, we saw it come out of the electrical sockets on the top floor! – these leaks are very easy to plug, once you see them. And they say it’s effective, because that can be very cold air, coming into an otherwise perfectly comfy room. You have to measure things to draw real conclusions. 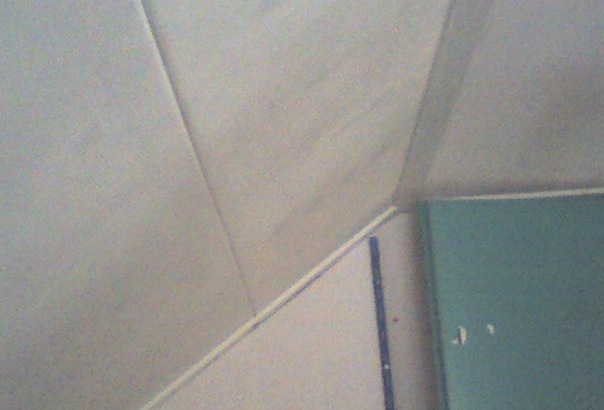 I went in with exactly the same scepticism, known how bad our end-70’s house is in some areas. The results were completely surprising, not in the extent but in the reasons for the leakage and the real hot, eh, I mean cold, spots. 800 W day-in-day-out is 7000 kWh on the yearly bill – sounds like an excellent place to look for savings! We also have two fridges – replaced the very old one in the basement/garage a while back, by a modern energy-lean model, but in fact it’s not consuming any power these days – the basement itself is cold already. I’m pretty sure you can get your baseline lower than 800W – can’t think of anything that would lead to such consumption levels, even with a freezer and two fridges. Just measure it – it should be easy to find the main 200..400 W culprit. If it’s the server + NAS, and they are fairly old, then consider replacing them – probably can be done for less than what you’ll save on a yearly basis. FWIW, power consumption here is also low in daytime – no lights on, just the central heating kicking in in winter. Which also translates to: “leaving more funds to tackle the consumption side” ? The alternative to investing in solar is to invest in reduction measures. Almost more important, even. Not just the fire department – also any Catholics around in case they think you’ve elected a new Pope. Please be aware that thermal images are only useful in combination with regular images taken at the same time of the same spot. If a so called expert gives you some thermal images of your house without further explanation and lacking normal photos he is no expert. Keep that in mind! 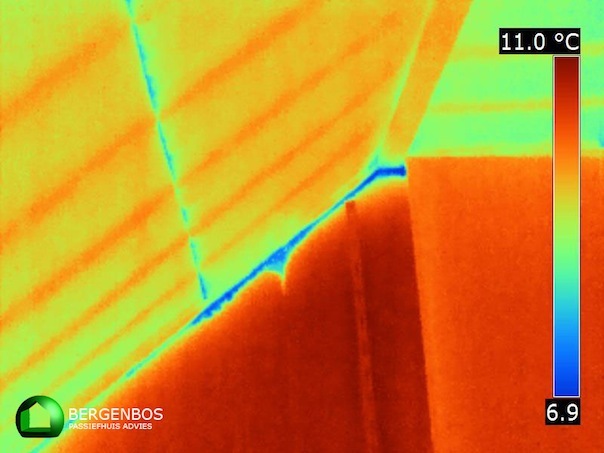 Thermal images require quite a bit of knowledge to interpret, like metal or glass surfaces and always keep an eye on the scale. Also, 10k isn’t that much for a thermal camera. @jcw Was the camera cooled with liquid nitrogen? No worries, I also got visual images for each IR one taken – the camera takes both at the same time. 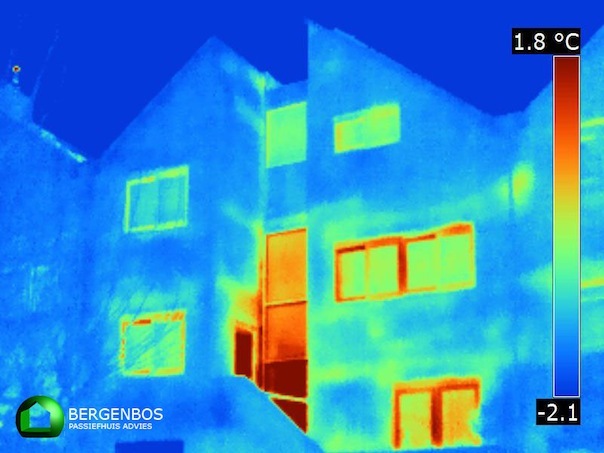 I’ve had FLIR pictures taken from the outside, inside (heating performance radiators) a few years back (also for free), and was flabbergasted by the results! Thanks JC – The quality of the images are the best I’ve seen I think – is there any chance you could give me a contact email so I can ask which camera they use? Many thanks. Yep! My contact there is Gerben Bos. Hi jcw. Thanks for the great site. Re your comment: “I’m also very surprised by the heat crossing over to the next house…”. Aren’t your neighbor’s houses just leaking at the same places as yours? Could be, but note that due to the spit-level design, the floors are not adjacent – each house floor alternates by one half height, once in the middle in the house itself, and again between the houses.